In an age of fragmentation, all of the world’s great powers confront enormous domestic and international pressures. Disappointments in Iraq and Afghanistan, the shocking savageries inflicted with seeming impunity by the self-proclaimed Islamic State and their imitators, North Korea’s defiant brandishing of its growing nuclear arsenal, and Russia’s invasion and annexation of Ukrainian territory reveal the limits of American power and an alarming spread of disorder. The European Union remains gripped by economic tensions that threaten to rip it apart, even as its member states fend off waves of desperate Middle Eastern refugees. Despite the efforts of an energetic prime minister, Japan appears incapable of arresting the steady erosion of its economic power and demographic decline. Russia, while flexing its muscles in Crimea and Syria, anxiously awaits the effects of a looming recession on its fragile economy and a bleak demographic outlook. China, meanwhile, has expended enormous resources to strengthen control of a vast, uninhabited maritime domain, even as its leaders accelerate a ruthless crackdown to curb social unrest as its juggernaut economy cools. These developments have coincided with a broader dispersion of power both internationally and at the societal level. The United States remains the single most powerful nation by far, but its share of world GDP has ebbed from a high of 27 percent in 1950 to 24 percent in 2015. China, meanwhile, has seen its share increase over the same time period from 5 percent to 15 percent. Indeed, the relative decline of the industrial world in recent decades has coincided with a “rise of the rest” as developing countries throughout Asia, Africa, and Latin America experienced tremendous gains in income, life expectancy, and well-being for their populations. At the societal level, the phenomenon of angry citizens taking action to show their frustration with their leaders hasrepeated in capitals the world over. Economic prospects have stagnated and public budgets weakened at the same time that more people have gained more access to information technology and modes of travel than ever before. The contradiction between rising public expectations and constrained government resources to address those demands underpins much of the gridlock, political polarization, and turmoil that have unsettled politics throughout the world. The Key to Henry Kissinger’s Success The statesman understood something most diplomats don’t: history—and how to apply it. In his new biography of Henry Kissinger, the historian Niall Ferguson recalls that halfway through what became an eight-year research project, he had an epiphany. Tracing the story of how a young man from Nazi Germany became America’s greatest living statesman, he discovered not only the essence of Kissinger’s statecraft, but the missing gene in modern American diplomacy: an understanding of history. The Thucydides Trap: Are the U.S. and China Headed for War?Ferguson’s observation reminded me of an occasion three years ago when, after an absence of four decades, Kissinger returned to Harvard. Asked by a student what someone hoping for a career like his should study, Kissinger answered: “history and philosophy”—two subjects notable for their absence in most American schools of public policy. Ferguson has crafted his biography of Kissinger not only as the definitive account of an incredible personal and intellectual odyssey, but also as an opportunity to initiate a debate about the importance of history in statecraft. The book plants a flag for a project in “Applied History,” which he and I have been gestating at Harvard for several years. By Applied History we mean the explicit attempt to illuminate current policy challenges by analyzing historical precedents and analogues. Following in the footsteps of the 1986 classic Thinking in Time by Ernest May and Richard Neustadt, our goal is to revitalize Applied History both as a discipline in the university and as an art in the practice of statecraft. 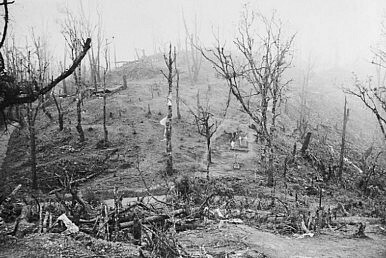 The Battle of Kohima saw northeast India emerge as a decisive battlefield in the Second World War. Tradition and history enrich the present. The American-born British writer T.S. Eliot wrote on the significance of tradition and historical sense in shaping the current discourse and worldview in his famous essay ‘Tradition and Individual Talent.’ For Eliot, tradition is part of a living culture and an important element in shaping its future. Both a people and a person are the result of tradition and historical sense, which is crucial to understanding one’s culture and country. A nation cannot grow without teaching and understanding its history. A new Indian documentary film, Memories of a Forgotten War, is an experiment to create awareness around a part of history that India seems to have forgotten. It revisits an important event in the past that helped shape the course of the subcontinent. The film is also an attempt to remind the nation about the important contributions of India’s northeast, a region which remains on the country’s margins despite its critical role in the struggle for Independence. Manipur and Nagaland in the Indian northeast were important frontiers of the Second World War in what was popularly known as the Burmese front. In the rough terrain and dense forests of the region, Indian and British forces fought a battle of particular significance against the Japanese army. The intense battle, which lasted over three months, saw the defeat of the Japanese, an event that sealed the fate of Tokyo’s imperial ambitions in South Asia. Popularly known as the Battle of Kohima, it was an important event in the history of colonial India. Had the Japanese army overcome British resistance, it would have delivered a huge blow to London’s hold on India. But Kohima proved to be Japan’s Stalingrad. Just as Germany lost its momentum after its defeat on the Volga in 1943, Kohima decisively ended the expansion of Japan’s offensive in South Asia. At the bilateral level, India and Malaysia pledged to increased bilateral cooperation on a range of defense and security issues, including maritime security, disaster response, and cyber security. 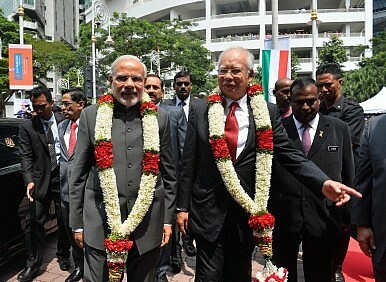 Modi and his Malaysian counterpart Najib Razak made combating terrorism a top priority of Indo-Malaysian ties, with Modi praising Razak for his role in combating extremism and radicalization in Malaysia. India’s soft power was also in the mix with Modi highlighting the cultural ties between India with Malaysia as he inaugurated a Torana gate, a traditional gateway to Hindu and Buddhist temples, with the Malaysian Prime Minister. Next, the Indian prime minister went to Singapore to commemorate the 50th anniversary of diplomatic ties between India and Singapore. Singapore is the second-largest source of foreign direct investment in India, and it is India’s 10th-largest trading partner. Not surprising, therefore, that Modi reached out to investors in Singapore, emphasizing his government’s economic reforms and underlining to an audience of business representatives from over 300 companies that India’s reforms have “successfully restored the credibility of India in the eyes of global players.” Modi projected India as “the most open economy in terms of FDI.” Among the many bilateral pacts with Singapore signed during Modi’s visit, the most significant was the India-Singapore Strategic Partnership Agreement, which is aimed at broadening and deepening ties across various sectors including defense, economics, and capacity-building. What is the reason behind the dal prices reaching astonishingly high levels at various points of time during the last few years? Dal prices, in particular tur dal (also known as arhar dal or pigeon pea) prices, have been on fire. The price of tur dal even crossed Rs 200 per kg sometime back. As I write this, the price of tur dal is still hovering around Rs 200 per kg. This trend has prevailed over the last few years where dal prices have reached astonishingly high levels at various points of time. Why is that the case? The reasons are both from the demand as well as supply side. As rural incomes have gone up over the last few years, the demand for dal as a source of protein has gone up. The supply hasn’t been able to keep pace. Over and above this, short term weather trends have led to massive spikes in dal prices. In 2007-2008, India produced 3.08 million tonnes of tur dal. In 2014-2015, the total production was down to around 2.78 million tonnes, which was lower than the production in 2007-2008. The total production in 2013-2014 had stood at 3.34 million tonnes. Hence, between 2013-2014 and 2014-2015, there was a significant fall in production of tur dal. Economists Ashok Gulati and Shweta Saini in a column in The Indian Express estimate that the “the consumption of tur hovers between 3.3 to four million tonnes.” Hence, there is a clear gap between the demand for and the supply of tur dal. We expect that civil servants must be competent, yet instinctively recoil from paying them well. Of course implementation of the Seventh Pay Commission’s recommendations will have a fiscal impact. Even if this works out to an additional 0.65 per cent of GDP — and the odds are that the estimate will prove to be understated — it would be a mistake to begrudge civil servants and pensioners the additional money. Now, public opinion anywhere in the world has no obligation to be logically consistent and India is no exception. We think the government must deliver public services, despite us knowing that it is bad at doing this. We expect that the procedures must be carried out by-the-book, but we still engage those “consultants” and hangers-on near the regional transport office and the sub-registrar’s office. It is no wonder then that our attitudes towards remuneration, of public officials, is self-contradictory. We expect that civil servants must be competent, yet instinctively recoil from paying them well. This attitude extends towards elected representatives too. Once on a television show, former Union Minister and Congress leader Mani Shankar Aiyar responded to my argument for realistic pay packages for Members of Parliament by saying that they should be paid the Rs.500 that was set during Mahatma Gandhi’s time. Similarly, there are many people who scrutinise the accounts of non-government organisations and express shock that their staff are paid “that much”. A direct consequence of this logically inconsistent attitude is that politicians who are honest have trouble maintaining themselves and their offices, civil servants yield easily to temptation and non-profits find it hard to recruit good talent. They shut down my column Under General Sharif, the Pakistan army is carrying out a low-intensity war against diversity of opinion. Along with putting the Pakistani COAS on a pedestal, his media team was actively weeding out his detractors. Pakistan’s globetrotting Chief of Army Staff (COAS) General Raheel Sharif has been peddling the ostensible success of a military operation called Zarb-e-Azb in assorted world capitals. The director of the Inter-Services Public Relations, Lt General Asim Saleem Bajwa, has unleashed a social and conventional media blitzkrieg that creates a halo of accomplishment, nay infallibility, around his boss, General Sharif. But in tandem with the military’s media blitz is its undeclared war on dissent, which impugns, maligns and tries to ostracise those in the intelligentsia who refuse to buy the military’s version of events. This low intensity, systematic war on the diversity of opinion in Pakistan barely gets local or international attention. During my morning ritual of going through emails this past Friday (November 27), I spotted one from my op-ed editor, which read: “It is with an extremely heavy heart that I regret to inform you that Daily Times will be unable to accommodate your daring and conscientious articles. Due to the climate under which print media operates in these times such pieces are constantly being put under scrutiny and so the newspaper with it. It is also my unfortunate duty to inform you that Rashed Rahman has resigned as editor-in-chief due to the same reasons of continued interference in the affairs of the editorial department and as a soldier for unbiased truth he is now serving his three months notice”. As the lead weekly columnist for the liberal Pakistani newspaper Daily Times, I have written extensively about how the dissenters in the Pakistani media, academia and the political class were hounded rel-entlessly; that the undeclared censor’s guillotine had fallen on my hand, was not a shock. What was surprising was that it took six years for it to do so. A recent high-level visit to Washington shows how Islamabad hopes for a renewed U.S. approach. 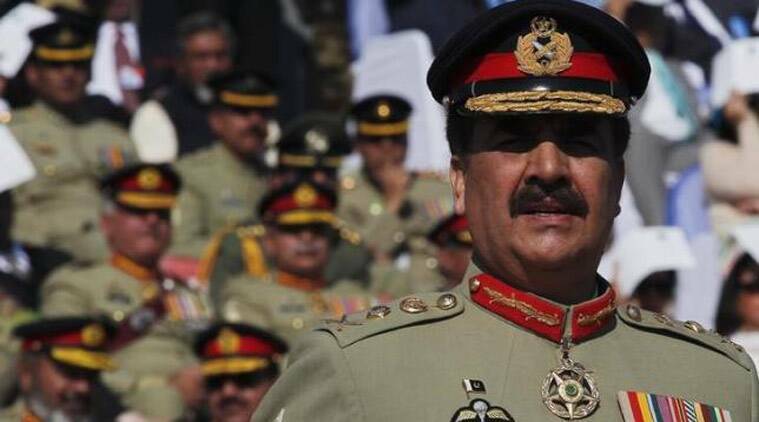 General Raheel Sharif, Pakistan’s Chief of Army Staff, was in Washington last week. He arrived on the heels of Prime Minister Nawaz Sharif’s visit a month earlier. The trips were independent yet related, with two different interlocutors discussing the same subjects: Afghanistan, Pakistan’s ongoing operations against militants in North Waziristan and its broader anti-terror campaign, the country’s nuclear program and India-Pakistan tensions. The army wanted to convey its own perspective on these issues directly and not solely through the civilian leadership. It has been leading the response to Pakistan’s security issues and felt its voice needed to be heard, believing it could better explain the security and foreign policy dynamics at the heart of the challenges facing Pakistan. Confirming the broad policy agenda of the visit, Gen. Sharif met with a number of administration officials and political leaders, including the heads of the CIA and the State and Defense Departments, as well as members of Congress. The highlight of the visit was a meeting with Vice President Joe Biden. The White House press release said both leaders “reaffirmed their strong commitment to peace in Afghanistan and the important role that the United States and Pakistan can play to support a reinvigorated reconciliation process in coordination with Afghanistan.” According to Pakistani official sources who spoke on the condition of anonymity, Gen. Sharif sought to clear up any misunderstanding or misperception in Washington about Pakistan’s security and counterterrorism policies and approach to the talks with the Taliban. After having heard from the “horse’s mouth,” the officials felt there should be a greater clarity about where Pakistan stands. And this is what Pakistan also wanted from Washington’s side: to know where it stands. 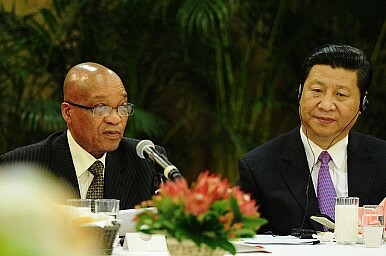 The Forum on China-Africa Cooperation Summit is being held this week. Perceptions of China’s role in Africa have been mixed. The nation has been viewed as imperialist and a supporter of dictatorships by some, and as a benefactor and promoter of peace by others. However, as China’s economy shifts from one that is strongly resource consuming and manufacturing intensive to one that is more consumer and service-oriented, the nation’s relationship with Africa is changing. Mutually beneficial agreements will be discussed further in the Forum on China-Africa Cooperation (FOCAC) Summit, which will take place this week in South Africa. China has provided Africa with much-needed infrastructure, such as railway, roads, and telecommunications projects, but some have argued that China does so to facilitate the extraction of natural resources. In fact, to some extent Chinese manufactured imports have reduced the competitiveness of South African manufactures, and South African President Zuma stated at the 2012 FOCAC meeting that the unequal trade relationship with China could not be sustained. Nigeria’s Central Bank Governor Lamido Sanusi has also commented that China’s relationship with Africa is imperialist, removing natural resources from the region. Still, China has provided much needed financing and training/technical expertise to African countries. Chinese financing plays an important role in funding infrastructure projects, since African banks lack the capital to fund such projects themselves. China has created thousands of training opportunities for Africans and also sent hundreds of thousands of technical professionals to the continent. Some countries, such as Ethiopia, have benefited from technology spillovers from Chinese firms, including private Chinese firms invested in manufacturing and services. A port project in Tanzania could become a model for connecting east Africa to China’s Silk Road. The following text reflects the discussions at the 5th BMW Foundation Global Table on the opportunities that China’s New Maritime Silk Road initiative holds for East Africa. The ideas on testing the inclusiveness of the One Belt, One Road initiative build on the 4th BMW Foundation Global Table in Poland, which focused on the Silk Road Economic Belt connecting China, Central Asia, and Europe. Following the Tanzanian general election of 2015, President Jakaya Kikwete will hand over power to John Magufuli after serving two terms in high office. 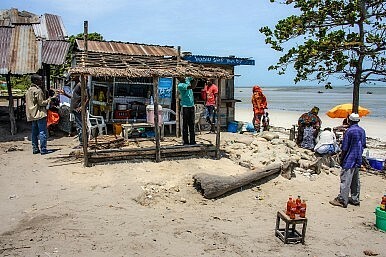 One of the most important legacies of his presidency could turn out to be laying the foundation stone for the construction of the Bagamoyo port, which also happens to be his hometown, located 60 kilometers up the coast from Dar es Salaam. Funded by China Merchants Holdings International and Oman’s State Government Reserve Fund, the project presents an opportunity to test the potential of China’s 21st Century Maritime Silk Road as game changer for Africa’s development. Will the New Silk Road succeed in aligning the “Chinese Dream” with an African one? The answer will largely depend on China’s ability to create a truly inclusive process, allowing all participating states, together with landlocked and geographically disadvantaged corridor countries, to bring in their respective interests. Africa and Europe should give China the benefit of the doubt and become active co-drivers of the process. At a time when China combines the world’s second largest economic power with growing military capability, the One Belt One Road (OBOR) initiative is being portrayed by the Chinese leadership as an illustration affirming the country’s peaceful rise and its readiness to shoulder greater regional and global responsibility. The New Maritime Silk Road reflects a strategic vision of a zone of economic development that maps along the key ports and maritime trade routes of the South China Sea and the Indian Ocean. Africa is a strategic center point in this framework. Projects to be undertaken under the “Belt and Road” framework in Africa are located in Bizerte, Tunisia; Dakar, Senegal; Dar es Salaam, Tanzania; Djibouti, Djibouti; Libreville, Gabon; Maputo, Mozambique; and Tema, Ghana. Xi Jinping just outlined an ambitious plan for military reforms, but implementation will take years. On November 26, Chinese President Xi Jinping – who also serves as chair of the Central Military Commission – announced a sweeping long-term reform plan for the People’s Liberation Army. The reforms, laid out at a meeting attended by over 200 military officials, will see streamlined command over China’s military, as well as a closer watch on corruption and graft. China currently has seven separate military commands, headquartered in Shenyang, Beijing, Jinan, Nanjing, Guangzhou, Chengdu, and Lanzhou. That structure, and the relative independence enjoyed by each regional commander, makes joint operations (particularly overseas) difficult to organize and execute. 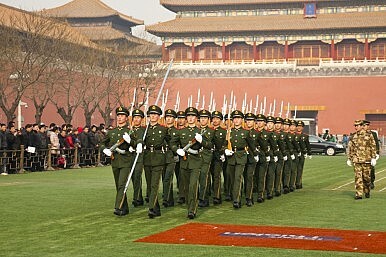 Under the reform plan, China would reorganize the commands. Xi did not go into detail on the reform plan, but South China Morning Posts expects the restricted military to have only four military commands. China will also move to create new “battle zone commands” designed to streamline joint operations. And the entire military structure would be overseen by a joint command, further emphasizing the necessity of interoperability between China’s military branches. Separating the myths from the research on China's $94 billion in Africa aid. The global development landscape is currently in a period of tumult. A number of developing countries that were once aid recipients are now aid donors, and they represent a growing proportion of the total money spent on international development. China is by far the largest emerging competitor in the global aid market, and its unique way of designing and delivering assistance is challenging the traditional policies and practices of Western powers. More and more money is sloshing around, as well as more players. China now has a robust bilateral aid program, but it’s also helped create alternative sources of multilateral funding for developing countries—namely, the Asian Infrastructure Investment Bank (AIIB) and the New Development Bank. Beijing is shaking the foundations of international order put in place by Western powers after World War II. Its attitude towards aid transparency norms is a case in point. China has opted out of global reporting systems, such as the International Aid Transparency Initiative (IATI), which were put in place by Western powers to facilitate donor coordination and minimize duplication and waste. Instead, Beijing has chosen to release few details about its rapidly growing international development finance program, making China’s foreign aid program an informational black hole. Print The Girl From Harvard, the Girl From China What it's like to live a double life. There are now over 300,000 Chinese students enrolled in American colleges or universities, up 10.8 percent from the year before and more than from any other country. The surge is bringing billions of dollars stateside and changing the face of American universities. It’s also changing lives like mine. I recently started my junior year at Harvard, and I still sometimes feel like I’m living a double life. In China, I’m known as “the girl from Harvard.” At Harvard, I’m known as “the girl from China.” Neither truly tells my story. In China, everyone puts too much stock in the fact that I go to Harvard — or more accurately, that I got in. I’m asked to review application essays, predict U.S. college admission results, help youngsters choose which American college to attend, and sometimes even dispense advice on romantic relationships (a subject on which Harvard, not surprisingly, lacks any particular curricular focus). High school students and their parents treat me as if I have an encyclopedic knowledge of America’s higher education system, asking me what kind of students Princeton might like, or which SAT II subject tests a student should pursue. More than twice, I have been asked why Yale rejected me. (If I knew, of course, I would have already dropped out of Harvard and promptly gotten rich advising anxious parents.) In China, a U.S. education is often seen as superior, and a Harvard education is perceived as the best of those. Yet I often find it hard to convey certain parts of Harvard life. For example, it is difficult to explain the notion of a “liberal arts education” to people who are conditioned to an education system that requires students to sign up for majors even before applying to college. It is harder still to convey the degree of freedom that we get in shaping our own college career in the United States. While my friends who are attending universities in China complain about a compulsory, dry course on Marxism–Leninism–Maoism, I get to choose from a wide variety of courses in the humanities, social sciences, and languages. Most Chinese people are also puzzled when they hear that I only spend, at most, half of my time on academic work, with the other half devoted to social life and extra-curricular activities. In China, a university (whose Chinese name literally translates into “big study”) is a place where one studies, while in America, I’m conditioned to feel that I would be wasting my Harvard career if I spend all my time immersed in books. The U.S.-led coalition’s recent offensive in Iraq’s Sinjar Mountain, supported by Kurdish Peshmerga forces, represents a much-needed tactical victory against the Islamic State of Iraq and the Levant (ISIL). The successful combination of Operation Inherent Resolve’s precision airstrikes, intelligence, and advise-and-assist support to over 7,500 Kurdish and Yezidi forces from Iraq, Turkey, and Syria effectively expelled ISIL from Sinjar and allowed Kurds to seize parts of the strategically important Highway 47 between Mosul and Raqqah — a supply and transportation route to Syria that ISIL depended upon. ISIL territorial losses in Ninewah have also helped facilitate the gradual return of persecuted local populations, including the Yezidis, to their homes. Still, tactical gains in Sinjar do not translate into a strategic victory over ISIL. While reinforcing the coalition–Kurdish alliance, the Sinjar offensive has exposed the deep divisions within the Kurdish camp, and the limitations of future Peshmerga engagements outside their claimed territories. Nor has reclaiming Sinjar enhanced Sunni Arab support for this war — requisite for effectively countering ISIL in Iraq and Syria. In some ways, the Sinjar aftermath has done just the opposite by reinforcing the ethno-sectarian conflicts into which ISIL has been superimposed. If the coalition wants to gain real momentum in countering ISIL in strategically significant strongholds such as Mosul and Raqqah, then it must pay closer attention to the second- and third-order consequences of its campaign on the local balance of power between ethnic and sectarian groups, particularly in Iraq’s disputed territories and where Sunni Arab support is vital. A deeper look into the Sinjar offensive challenges assumptions about Kurdish capabilities and momentum toward Mosul. The Kurds did not expel ISIL and gain territories from a position of strength, but rather, from one of weakness. The Sinjar offensive was unlike offensives in southern Baghdad, where Iraqi Security Forces (ISF) and popular mobilization units (PMUs), or Shi’a militias, expelled ISIL with concentrated force but minimal airpower. At Sinjar, heavy coalition airstrikes, alongside ground support from Kurdish forces from Turkey and Syria, as well as Yezidi fighters, neutralized ISIL in the months before the actual liberation maneuver was launched. It was this combination of force, and not the presence of any single Iraqi Kurdish Peshmerga faction, that led to an ISIL retreat (or, as some say, a mere tactical withdrawal) without a lengthy urban battle. In the accelerating public discussion of ISIL, it’s easy to become focused on what we don’t know: its elusive leader, its shadowy connections abroad, the gruesome propaganda emanating from somewhere on the Internet. Much about the group suggests a mysterious terrorist entity with an apocalyptic ideology that aspires to strike everywhere, including here in America. Reporting on ISIL is extremely inconsistent, its leaders rarely appear in public and its extensive social media machine makes it hard to tell its propaganda from fact. Deciding how we think about ISIL is critical to deciding how to fight it. President Obama said he plans to stay the course by intensifying his current policy, which you might call containment plus: contain the group’s expansion in Syria and Iraq, and hasten its demise with steady air strikes and support to regional allies. His critics, meanwhile, call for a range of options, from allowing local forces to defeat the group, to easing the rules of engagement for airstrikes, to deploying U.S. special forces, to a large-scale campaign using 20,000 or more U.S. troops in direct combat ground roles. Which is right? The answer depends at least in part on what kind of an enemy we think ISIL really is. Is it a tremendously well-resourced terrorist group that controls substantial territory, which it uses to plan attacks, vet operatives and manage a complex financial network? Or is it a fledgling nation-state that sponsors terrorist attacks? If we view ISIL as the former, then containment seems like an odd strategy, since even if contained it could continue to support terrorist attacks. But if we view it as a state, then it looks very different: a desperately poor nation trying to fight a three-front war—Iraq to the East, the Kurds to the North and Syria and other insurgents to the West. Is there a method to ISIS's madness? Editors’ note: In this piece, originally published by The Atlantic, Shadi Hamid examines why trying to think like the Islamic State is so hard—and risky. In killing 130 civilians in Paris—the worst such attack in France since World War II—ISIS has forced us to contend, once again, with the question of the “rationality” of self-professed ideologues. Since it wrested the world’s attention with its capture of Iraq’s second-largest city in June 2014, the extremist group has prioritized state-building over fighting far enemies abroad. This is what distinguished ISIS: It wasn’t just, or even primarily, a terrorist organization. It had an unusually pronounced interest in governance. As Yale University’s Andrew March and Mara Revkin lay out in considerable detail, the group focused its energy on developing fairly elaborate institutional structures in the territory it controlled within Iraq and Syria. ISIS wasn’t simply making things up as it went along. It may have been mad, but there was a method to the madness. But why, then, attack France—one of the more militarily aggressive Western powers—and potentially provoke a massive retaliatory response that would threaten the very “caliphate” it had spent so much time building? Care is needed in drawing conclusions from this apparent shift in targeting. ISIS has always had international ambitions; it was more a question of when, not if. Part of the challenge is in divining why exactly ISIS chose to stage these attacks at this particular time. And this raises a difficult set of questions: To what extent, in the wake of the Paris attacks, should ISIS be thought of as rational, and how, in turn, should that inform efforts to understand the group and develop a strategy to counter it? The attack on France may very well prove to be ISIS’s first obvious, huge mistake, at least from a caliphate-building perspective. That said, while many outside observers might think ISIS made a major miscalculation, the group—or whatever part of it directed the attack—probably doesn’t agree. Otherwise, why would they have done it? Want to help the Islamic State recruit? Treat all Muslims as potential terrorists. Of course, most religions — including Christianity — have been manipulated to inspire or excuse terrorism. And people of most nationalities — including Americans — have committed terrorist acts. So the critical question is not whether the Islamic State has a national or religious aspect; a great deal of terrorism does. The question is: Will policies that discriminate against people on the basis of nationality or religion help or hurt efforts to counter the Islamic State’s terrorist threat? Many excellent scholars — both before and since 9/11 — have produced research that tells us about the relationship between discrimination and counterterrorism. Here’s what we know. To be most effective, counterterrorism policies need to make an explicit distinction between the individuals who genuinely threaten others with terrorism, on the one hand, and on the other, the broader populations those terrorists claim to represent. Counterterrorism efforts — especially using force — should narrowly target only the former, as much as possible. Why Do We Even Have A Military? OK, we’re all appalled by the Paris attacks. But what do we do now? The President wants to maintain his strategy of half-measures, even as members of his own party beg for a change. But then, talking heads recite the politically correct, multicultural catechism about Islam. Politicians cringe at the idea of putting boots on the ground and flail about for some new, innovative way for America to fight wars without, you know, really fighting wars. We are reminded that there is “no military solution” to Daesh. We shake our heads at the barbarism of Daesh and then warn ourselves of hazily-defined “overreactions.” We try to degrade the attacks down to the level of a glorified gang shooting. And Madonna wants us all to just love each other, which, by far, seems the most palatable solution. I mean, who doesn’t love love? And so the country quivers, Hamlet-like, in a tepid, neurotic martiality.We’ve been telling the military to “take a knee” long enough. It’s enough to make you wonder, why do we even have a military? We tend to look back fondly on the Nazis as the last enemy we all could agree warranted a full-scale military solution — but isn’t Daesh as bad? It’s certainly more of a threat to the homeland than the Nazis were in 1941. Or are we comfortable hating on Nazis only because Nazis were white, western Europeans? Has multiculturalism and political correctness inflicted such a Stockholm Syndrome on us that we can’t admit that “exotic” Daesh is a threat that demands a hard-power, military response? Why do politicians squirm away from the inevitable conclusion that military force is the only way to bring Daesh to heel? Why did Turkey shoot down a Russian fighter-bomber? Tactically, the Russian Su-24 may have crossed briefly into what they Turks consider their airspace. That area, now controlled by Turkey, used to be part of Syria and is still claimed by Syria. If the Russian pilots were using Syrian maps, they thought they were still in Syrian airspace. But to the Turks, they were flying over Turkish territory. Operationally, the Turks may have shot the plane down in Syrian airspace because it was attacking Turkmen rebels in Syria. Turkmen are ethnic Turks who live outside Turkey. They are found in an arc that runs from the Mediterranean to China. Turkey claims a special right to protect Turkmen wherever they are found. That claim ties into the real reason Turkey shot the Russian jet down. Following the islamic bombings in Paris, French President Hollande set out to form an American-French-Russian alliance against ISIS. Russia is eager for such a grand coalition. Turkey did not want it to happen. Why not? Because at the strategic level, Turkey is allied to ISIS. The shoot-down pulled NATO and the U.S. away from Russia, because both felt they had to line up with a fellow NATO member, Turkey. Behind closed doors, they read Turkey the riot act, but in public they had to blame the Russians. Just at a point where, thanks to the French, the U.S. and Russia might have come together against ISIS, the Turks pulled them apart. Turkey’s de facto alliance with ISIS has been visible for some time. ISIS’s supply lines run through Turkey, which they can only do with the approval of the Turkish government of President Recep Erdogan. Recent ISIS bombings in Turkey have been directed against Erdogan’s political opponents and the Kurds. Turkey regularly carries out bombing missions in Syria aginst the Kurds, America’s only effective ally on the ground and ISIS’s most dangerous opponent. ISIS in turn fights the Kurds, Turkey’s most hated enemy. Note that Russia now has an opportunity to put an end to those Turkish airstrikes on the Pesh Merga. 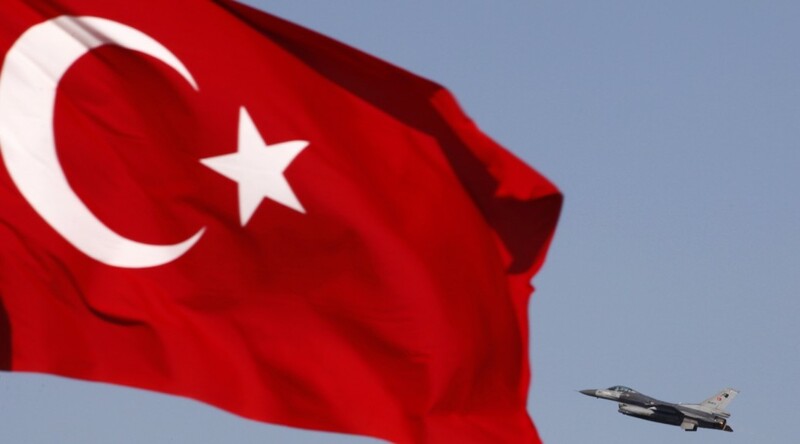 It can declare any Turkish warplane found in Syrian airspace a target on the grounds that what goes for (claimed) Turkish airspace also goes for Syrian airspace. Russia is openly Syria’s ally; why shouldn’t it help Syria assert its sovereignty in the air? The walls are going up all over Europe. In Hungary, they take the physical form of razor and barbed fences, like much of the old iron curtain. In France, Germany, Austria and Sweden, they are border­controls temporarily reimposed, within the border-free Schengen area. And everywhere in Europe, there are the mind walls, growing higher by the day. Their psychological mortar mixes totally understandable fears — in the wake of massacres perpetrated in Paris by people who could skip freely to and fro across the frontier to Belgium — with gross prejudice, stirred up by xenophobic politicians and irresponsible journalists. What we are seeing in 2015 is Europe’s reverse 1989. Remember that the physical demolition of the iron curtain started with the cutting of the barbed wire fence between Hungary and Austria. Now it is Hungary that has led the way in building new fences, and its prime minister, Viktor Orbán, in stoking prejudice. Europe must keep out Muslim migrants, Orbán said earlier this autumn, “to keep Europe Christian”. 1975 means more to the region than just the end of the Vietnam War. This year, we commemorate the 40th anniversary of the end of Vietnam War, a two-decade conflict that pitted a poor and divided Asian nation against the rich and powerful United States. Understandably, it was a politically significant moment in world history. But there were other equally memorable events that took place in Southeast Asia in 1975. Aside from the end of war in Vietnam, elsewhere in the region, the year also marked the start of the Indonesian invasion of East Timor, the rise of the Khmer Rouge in Cambodia, and the escalation of Muslim rebellion in the southern parts of Thailand and the Philippines. When the army from the communist North Vietnam arrived in Saigon on April 30, 1975, the war had already been raging on for two decades. The war killed at least three million Vietnamese and more than 50,000 Americans. 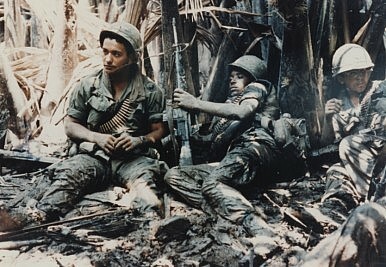 While Vietnam may have ‘won’ the war, it was a devastated country in 1975. Its rural and urban centers were in ruins and its economy was devastated. If Vietnam succeeded in expelling American troops, it failed to remove the bombs left behind by the invading army. Over the past 40 years, more than 100,000 Vietnamese have been killed or injured by these bombs andland mines. Another grim legacy of the war is the poisonous impact of Agent Orange, which the Americans used against the Vietnamese Army. The chemical warfare not only destroyed Vietnam’s agriculture but also affected residents who were exposed to it. About three million people, including 150,000 children, suffered from defects caused by Agent Orange. Washington's strategy has been crippled by a near-exclusive focus on solving problems with military means. The 2015 National Security Strategy (NSS) of the United States says the nation’s primary strategic imperatives are to ensure the “security of the United States, its citizens, and U.S. allies and partners; A strong, innovative, and growing U.S. economy… A rules-based international order…that promotes peace, security, and opportunity…” The Pentagon seeks to accomplish those objectives by “employing the instruments of national power in a synchronized and integrated fashion...” Those laudable goals make up our strategic theory. But how are we doing in the only place it matters: on the muddy, messy, and complex ground? We’re in desperate need of change. If the national objectives outlined in the NSS have been our target, our foreign policy has failed miserably over the past several decades and currently works at cross-purposes to American interests. Consider the national and international environment that faced the United States on September 10, 2001, the day before the horrific terror attacks: there were no American troops engaged in any war. The U.S. economy was very strong, enjoying a budget surplus that year of $163 billion. Al Qaeda, small in numbers, posed a limited threat to the U.S. and the world. Since that time, American combat troops, often numbering in the hundreds of thousands, have been continuously fighting wars on multiple continents; the budget deficit for FY2016 is projected to be $474 billion; and the terrorist threat has exploded in capacity and capability, representing a serious threat to the United States. Are these developments merely a product of external factors foisted on our country, or have our strategic actions been partly to blame? To be blunt, how Washington thinks stinks. Here’s a thought. Perhaps part of the reason the world seems to have gone haywire for America is that our nation’s leaders don’t think as well as they used to—that all our great thinking is behind us. The best prescription for fixing that may lie in how we prepare generals, diplomats and policymakers to lead. Even during the Cold War, America’s best and brightest weren’t always at their most cool-headed. Remember the Bay of Pigs? Not the smartest move ever. Lyndon Johnson’s war? That didn’t go so well. There is a long list of other tragic misjudgments, dictator coddling and dirty tricks. On the other hand, from George Kennan’s strategic vision in the Long Telegram to Ronald Reagan tying Moscow in knots, there were certainly bright spots. On balance, America didn’t make out so bad. The U.S. ended the Cold War stronger than when it started. The world was richer. There were more democracies. Now Americans look back at the promise of a world that seems far out of our reach today. Those of us who cover the US military in detail, those in the military and those who spend lots of time around the military tend to be at least mildly obsessed with Star Trek and Star Wars. As his opening make clear, Dean Cheng is truly one of the tribe. But his topic, freedom of the seas and how the US, China and other countries cope with the difficult calculus of Taiwan, China, the South China Sea and the larger questions of international law and trade — let alone what is right — is deadly serious. Read on. The Editor. When the Jedi Council assembled in Star Wars Episode I “The Phantom Menace,” they discussed a prophecy that they would soon be joined by one who would “bring balance to the Force.” Little did they expect that the One would achieve this balance by collapsing the old order. Reality now seems to be mirroring fiction, as the Administration steadily obscures what it means by the “rebalance” to Asia in the six weeks leading to the next episode of the “Star Wars” franchise. American B-52s and the USS Theodore Roosevelt carrier battlegroup both operated in the South China Sea recently, providing ample opportunity to conduct operations within 12 nautical miles of China’s artificial islands, and clearly sending the message to Beijing and the world of the seriousness with which the United States takes freedom of the seas. With Russia itching to fight after one of its jets was shot down by Turkey, we assess why Putin's war tech might be better than many people believe. ​Vladimir Putin is not a man to back down from provocation, especially a direct, lethal provocation like the shooting down of a Russian Su-24 aircraft by Turkey on Tuesday. Such an attack raises the possibility of a direct military confrontation, and makes you wonder just what Russia could do if you rattled its cage. How dangerous are they? Russia's defense complex may be just a shadow of the old Soviet Union, with defense spending only about 12 percent of the USA's. As such, many in the West tend to see Russian hardware as second-rate—stuck with 1970's electronics, crude manufacturing standards, and no money to improve matters. If the Russians make anything good, the thinking goes, they must have copied it from the West. The poor performance of the Russian-equipped Iraqi army in 2003 (and Russian-supplied Arab forces against the Israelis) reinforces the idea of inferior Russian military tech. In reality, Russia can be innovative in weapons design, and sometimes ahead of the West. Occasionally the country pursues crazy ideas than cannot work, like mind control weaponry. Yet just as often they develop weapons with no counterparts in the U.S.
Nobody should doubt Russian rocket science. After all, they have provided all the manned flights to the International Space Station since the retirement of the Space Shuttle in 2011, and Russia's military rockets have a long pedigree. China launched its latest military spy satellite Thursday with the successful deployment of the Yaogan 29 payload in polar orbit, likely adding a new radar reconnaissance craft to the country’s space fleet. The Yaogan 29 spacecraft, identified only as a remote sensing satellite by Chinese state media, lifted off at 2124 GMT (4:24 p.m. EST) Thursday aboard a Long March 4C rocket, the official Xinhua news agency reported. Launch from the Taiyuan space center in northern China’s Shanxi province occurred at 5:24 a.m. Beijing time Friday. The three-stage, liquid-fueled Long March 4C rocket deployed the Yaogan 29 satellite into orbit about 382 miles, or 615 kilometers, above Earth at an inclination of 97.8 degrees, according to U.S. military tracking data. Space experts believe the Yaogan name is a cover for Chinese military satellites, and the details of Thursday’s launch of Yaogan 29 match three previous rocket launches, which lifted off in 2006, 2007 and 2010 from the same launch site, aboard the same type of booster and placed their payloads into nearly identical orbits. The similarities mean Yaogan 29 is likely a successor to the Yaogan 1, Yaogan 3 and Yaogan 10 satellites, which analysts say carried high-resolution radar mapping instruments for all-weather reconnaissance. Chinese authorities did not announce Thursday’s launch in advance, keeping with the country’s practice of not publicizing its military space missions. The launch of Yaogan 29 marked China’s 16th space launch of the year, and the 69th rocket flight to reach orbit worldwide in 2015. The Army’s centralized selection list process explained. Every year, hundreds of officers approach a professional development milestone that will determine whether they achieve what many consider a lifelong goal. That milestone is the battalion command selection board. Though they’ve put in hard work over countless hours to become competitive for this board, most officers are uninformed about how the Army selects battalion commanders and slates them to specific units. Even officers I worked with at U.S. Army Human Resources Command were not aware of the intricacies of the process. This post aims to close that knowledge gap by explaining the centralized selection list, or CSL, process. It is ultimately relevant for anyone who wants to compete for battalion command at some point in his or her career. This article does not officially represent the Army or HRC. Rather, it is my interpretation of regulations, policies, and mentorship I’ve received from senior officers, lieutenant colonels slated for battalion command next year, and current/former members of HRC. It is also a reflection of my own experience as an officer currently in the midst of the CSL process. If I were to give a professional development class on the topic, this article is what I would teach. Every year in professional sports, millions, perhaps billions, of dollars are spent on personnel costs — scouting, recruiting, healthcare and salaries — all in the name of winning a game. The objective is simple: maximizing and bringing to bear the physical abilities of the world’s best athletes. Similarly, in the military, the top of the human performance ziggurat is represented by the combat arms — infantry, armor, artillery, engineers, and at the pinnacle of fitness and physical ability, special operators. 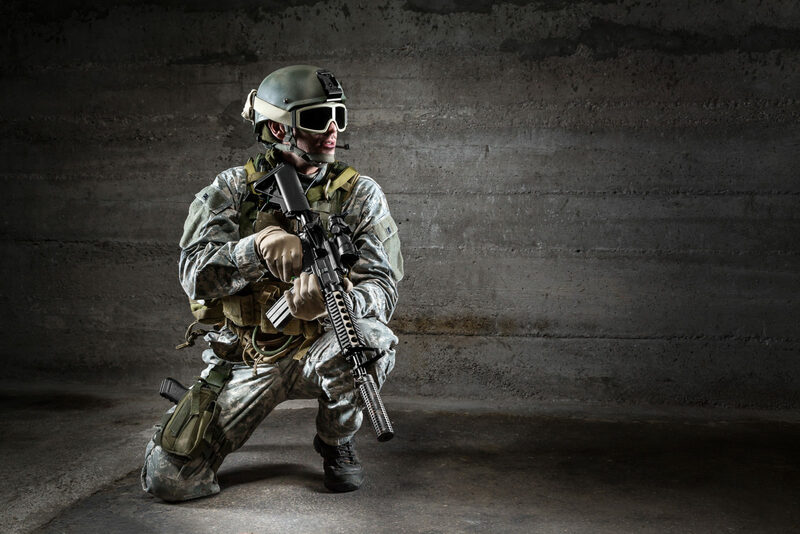 Given these similarities, sports medicine — the science of human performance — provides valuable insights into the ingredients in fielding a winning combat team, and the costs of compromising. The current controversy over opening ground combat to female service members would benefit from the objective analysis of data. In the 1980s, our research group, the Institute of Human Performance, was asked by the Marine Corps to discern the relationship between the Marines’ PFT (physical fitness test) and combat performance. Our efforts and the results of this study are highly relevant to the inflamed debate on women in direct ground combat units. And while opinion inevitably plays a major role in this debate, all sides will benefit by considering our observations principally because they are based on scientific research. The conclusions based on our research results should influence objective discussion. While this study was conducted nearly 30 years ago, it has relevance today since all the metrics remain unchanged: A minute is still 60 seconds, gravity’s force is still 32 feet per second squared, and consuming one liter of oxygen still burns five calories. While the contentiousness and framing of an issue such as this one change over time, science remains the same. There is great disorder under heaven, and the situation is excellent. Damn, that was close. The young captain peeked out from underneath a table in the Wing Operations Center (WOC), hand atop his helmet. Aside from the noise, you could tell the close ones by the dust dancing in the beams of the emergency lighting. A good shock brought out the fine particles from every nook and cranny. Nothing’s on fire, that’s good. Lets see what’s left. Gingerly, the rest of the staff emerged from where they had taken cover when the sirens wailed. Alan knew that nobody was really aiming at him, but it felt personal. He much preferred the days when he was flying instead of running the mission planning cell. At least in a fighter he was a moving target.